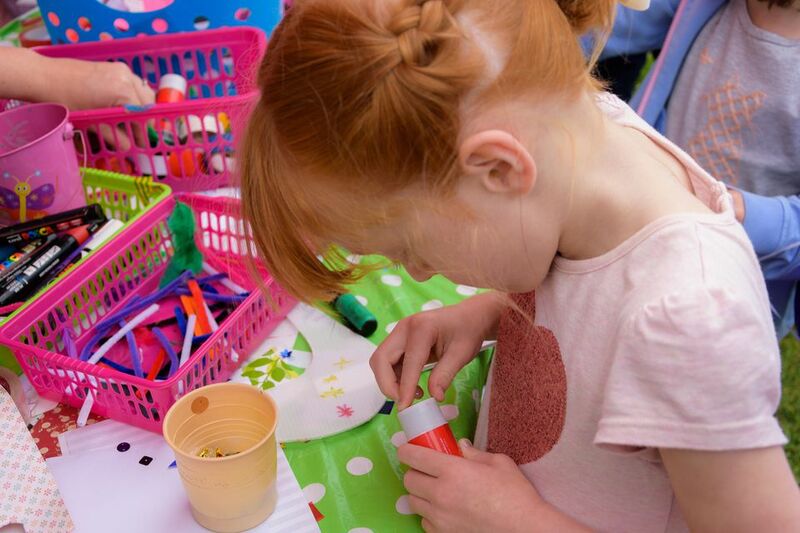 If you have a child who really loves to get her hands working on some kind of art project, a craft party may be the perfect way to celebrate your budding artist’s birthday. Ideas for craft birthday parties can range from ones that focus on making a single craft or those that treat guests to a variety of fun arts and crafts projects to enjoy. Whether you’re just starting to plan from zero or are already set for the main activity but looking for extra details to make your event complete, these ideas for a craft-themed birthday party are here to help. So, you’ve decided to throw a craft party. But how do you decide on the actual craft? From modeling clay to mod-podge, there is a vast array of mediums, projects, supplies, and ideas from which to choose. One way to narrow down your options is to start with what most appeals to the birthday child. Is he an avid fan of cutting and pasting? If so, a collage project would be a fun craft for him. A child who loves to paint, on the other hand, might do better with an art party where each kid gets to unleash her creativity with her own little canvas and paint pallet. Another thing to consider when choosing your party craft is the age of your guests. Choose something they can do mostly on their own. If you have a mixed group of ages, consider doing a couple of different crafts, or a single craft that can be modified according to skill level (maybe a younger child can paint a wooden box while older kids use decoupage to decorate theirs). As you can see, the options are seemingly endless. Perhaps another determining factor for selecting the right party craft will be the items needed to make it. Once you have decided on a craft, it’s best to make a supply list so you can be sure not only to have enough for each guest but that the cost of supplies will fit the party budget. Consider what will be needed individually and what can be shared (scissors, glue, and tape?). This will make shopping and set up much easier. Many crafts look simple enough at first glance but often can be a bit more complicated or take more time or supplies than originally thought. It’s best to discover any pitfalls prior to and not during the craft party. Then you can see for yourself how long it takes, if the instructions are truly complete or if there are any tweaks you can make to have the process flow more smoothly. It’s also a good way to find out if a project that seemed like a great idea in the picture could be a total bust at the party. For instance, if the glue takes too long to dry between steps, kids may not be able to finish in time to take home a completed project at the end of the party. That would be a letdown, to say the least. Making a sample craft ahead of time is worth the time it takes to ensure a successful party. Making seasonal wreaths or wall hangings. Knitting, crocheting, embroidery or needlepoint. Consider the location when choosing a craft for an arts and crafts birthday party. If your kitchen table will do, go ahead and throw the party at home. If you need to spread out and work on folding tables, maybe the backyard is best, or even the local park. Consider the possible need for tarps or tents if it should rain, however, or how well the craft will work outside on a windy day. If space and weather is a concern, look for other indoor party venues that can host your events, such as a social hall or even an art studio that will work with you to suit your party needs (they may even be able to work out a party package complete with supplies). In the spirit of the creative theme of a craft party, it only makes sense to decorate in DIY style, right? Balloons are always a simple, fun staple of the birthday party decor. Instead of ordinary balloons, however, why not dress them up in crafty style? You can use paint, markers, glitter, stickers, or even sheets of paper and fabric to turn them into just about anything from abstract orbs to adorable animals. Along with the tricked out balloons, use handmade paper birthday banners, food signs, and table settings to give your whole party an arts and crafts feel. Your guests will be busy molding, painting, cutting, and pasting with busy hands that may not want to stop for a sit-down meal. Finger foods, snacks, and simple beverages (preferably in spill-proof containers) are your best bet. Avoid greasy or colored foods that may lead to fingerprints on their projects (leave those orange cheesy puffs in the cupboard!). Tea sandwiches and pouch drinks are a good choice for food that will be served during craft time. Of course, if you have the time, you can schedule the food for after the craft is complete. You can even have a tea party while the crafts set to dry or are placed in cute take-home, favor bags. For the birthday cake, consider desserts that fit the theme. A rainbow cake for a tie-dye party or a cake that has been decorated to look like a paint pallet is just a couple of fun menu ideas for an arts and crafts party. If the crafting time only takes up a portion of your party schedule, or if some kids may finish sooner than others, you can have some art party games ready to play. Of course, you can also go with some traditional kids’ party games, such as Freeze Dance or Musical Chairs. If you want to keep the creativity flowing, however, think about setting up a freestyle arts and crafts station. Set the table with a hodge-podge of craft items they can use to create anything they like. Set up an area with plenty of coloring pages and crayons. Line a table with craft paper. Top it with crayons, colored pencils, and markers. Place a box of sidewalk chalk near a sidewalk if outdoors. If inside, pair the chalk with black construction paper. Or, purchase removable vinyl chalkboard decals that hang on the wall. Arrange them to make a large chalkboard that kids can doodle on for fun. Turn a wall into a giant canvas by lining it with art paper. Kids can paint a mural (that can later be taken down). A craft party eliminates the need for favors because kids get to take their projects home. A fun idea is to wrap their crafts like presents or place them in lovely gift bags to give it the feeling of taking home a special present they created for themselves.